Background/Aim: Inflammatory bowel disease (IBD) is increasing in Saudi Arabia but there's little knowledge about its risk factors. Our aim is to investigate the dietary risk factors of this disease in Saudi children. Patients and Methods: The children investigated for IBD were prospectively enrolled. Those with confirmed IBD were designated cases and the others were controls. The average food frequency intake at least 3 months before onset of illness was obtained by direct interview and recorded on a modified food frequency questionnaire. Fast food, sweet gaseous soft drinks, fruits, and vegetables were selected. Statistical analysis included descriptive statistics, multivariate logistic regression was used, and the odds ratio was calculated to report the statistical significance of the results. Results: A total of 91 children, 52 IBD (38 CD, 14 UC) and 39 controls were enrolled. Consumption of fast food and sweet gaseous drinks was more frequent in children with IBD than controls, whereas consumption of fruits and vegetables was less frequent in children with IBD. Only less fruits consumption was significantly associated with IBD as the odds of children getting IBD was 2.89 (1.06, 7.87). Conclusions: We report statistically significant positive association between less fruits consumption and IBD. Awaiting the results of larger sample size and more quantitative studies, the benefits of frequent fruit consumptions should be part of public health education. Inflammatory bowel disease (IBD) most commonly including Crohn's disease (CD) and ulcerative colitis (UC) are chronic relapsing conditions that affect both adults and children. The incidence is highest in Western populations of Europe and in the United States of America (USA) and the trend of increasing incidence with time is reported., Similarly, with improvement of socioeconomic status, many non-Western countries have witnessed increasing incidence as well., In addition, generations of migrants from countries of low incidence, usually developing countries, to high incidence countries (Europe or the USA), have similar incidence of IBD. Although the etiology of IBD is still unknown, the current hypothesis involves an altered immune response to triggering factors in a genetically susceptible individual. The fact that genetic susceptibility genes explain a minority of cases of IBD and the increasing incidence in almost all populations suggests an important role of environmental factors in the pathogenesis of IBD. Accordingly, smoking, use of contraceptives, non-steroidal inflammatory drugs, antibiotic exposure, diet in the adult population, have been mostly suggested as the reasons, in Western literature.,,,,, Similar to other developing countries, the increasing incidence of pediatric IBD in the Kingdom of Saudi Arabia (KSA), where the disease was unknown in the past, strongly suggest a role of environmental factors. However, except for diet, most of the above-mentioned factors are of limited relevance for children. The lack of information on diet IBD in Saudi Arabia, particularly in children, prompted this study with the main objective to assess the role of pre-illness dietary lifestyle in childhood-onset IBD. The children and their families were prospectively enrolled in a study of characteristics of childhood-onset IBD in the KSA. Informed consent, according to guidelines of the Institutional Review Board (IRB), was obtained from parents and/or children at the time of enrollment in the study. Dietary history was obtained from mothers and their children attending Gastroenterology Clinics at King Khalid University Hospital, King Saud University (free care general hospital), and Al Mofarreh Polyclinics (private practice) in Riyadh, KSA. In these clinics, the children were evaluated for various complaints. Children who met the standard criteria for the diagnosis of IBD were considered IBD cases. All controls were enrolled prospectively as well and included children investigated for IBD or celiac disease, but those found to be negative are therefore designated as appropriate controls. The diagnosis of IBD and the differentiation between CD and UC were in accordance with the guidelines from the European Society for Pediatric Gastroenterology and Nutrition. Mothers and children were asked about the average food frequency intake by children at least in the 3 months preceding onset of symptoms. This dietary history was completed at the time of enrollment in the study and recorded using a modified brief food frequency questionnaire, which was part of the IBD study database., The food items selected (fast food, sweet gaseous soft drinks, fruits, vegetables) were based on previous reports in adults and children, suggesting association with IBD., Mothers and children interviewed by research assistants were asked to estimate the average food frequency consumption for each of the items in the questionnaire using multiple choice answers varying from daily, twice weekly, weekly, and monthly or less frequently. However, because of small sample size, daily and twice weekly frequencies were combined in one group and weekly and monthly or less frequent consumption in another group. Data were analyzed using MedCalc version 12.2.1.0 software (Mariakerke, Belgium). Descriptive statistics (frequencies and percentages) were used to quantify the categorical variables. Bivariate and multivariate logistic regression analysis were carried out to quantify the association between food items frequency and IBD. 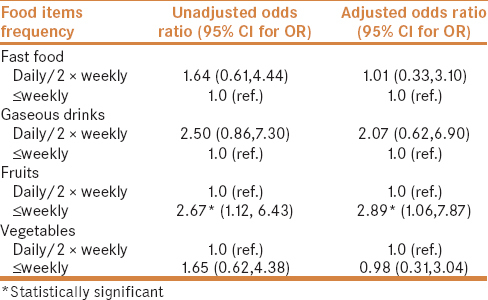 Unadjusted and adjusted odds ratio (OR) with corresponding 95% confidence interval (CI) were calculated to report the statistical significance of the results. This report is part of the study of characteristics of pediatric IBD in Saudi children and adolescents approved by the IRB of the College of Medicine, King Saud University (No. 10/2647/IRB), Riyadh, KSA. A total of 91 children, 52 IBD (38 CD, 14 UC) and 39 controls were enrolled. The mean and range of age of children with IBD and controls were 13 (1–18) and 12.2 (3.3–18) years, respectively. Male to female ratio were 0.52 and 0.54 for children with IBD and controls, respectively. [Table 1] shows the type of food items included in the questionnaire. These were selected based on common consumption by children in this population. 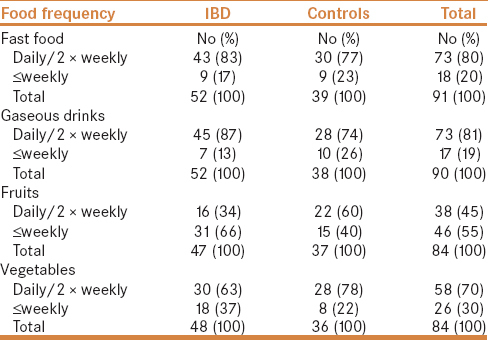 Food frequency consumption in children with IBD and controls is depicted in [Table 2], indicating more frequent consumption of fast food and sweet gaseous drinks in children with IBD. [Table 3] displays the results of multivariate analysis, indicating association between food item frequency and IBD. There was an independent statistically significant positive association between less fruits consumption and IBD (OR 2.89). In addition, although not statistically significant, there was a trend of negative association between frequency of a pattern of more common consumption of fast food [OR = 1.01 (95% CI: 0.33, 3.10)] and sweetened gaseous drinks [OR = 2.07 (0.62, 6.90)] in children with IBD, but no association of consumption of vegetables in IBD children [OR = 0.98 (0.31, 3.04)]. Nutrition in IBD includes preventive and therapeutic aspects. The therapeutic aspect including effectiveness of diet in induction of remission in CD children is well established and will not be discussed in detail as it is beyond the objective of this article. However, the preventive aspect of diet has been reported extensively and summarized in recent guidelines of the European Society for Clinical Nutrition and Metabolism, which state that a diet rich in fruits and vegetables, n-3 fatty acids, and low in n-6 fatty acids is associated with reduced risks of developing CD and UC and therefore should be recommended. It has been suggested that the study of IBD in children is more likely to increase understanding of triggering or causative factors because of limited exposure to confounding environmental factors. This is particularly true in children from developing countries, such as the KSA, where IBD which was extremely rare a few decades ago, is now increasing in incidence and time trend. In these countries which have a different dietary lifestyle than the West, studies of the role of diet as risk factor for IBD may be an important addition to the literature. To our knowledge, this is the first study in children from developing countries, to report the dietary risk factors in childhood-onset IBD. In this study, we used food group frequency consumption, rather than primary components to facilitate translation into practical application in dietary education. Fast food, in general, are high energy food implicated in overweight and obesity. In this report, there was a pattern towards the association of frequent fast food consumption with IBD. The fact that the association was not significant may be due to small sample size and because of the semi-quantitative measure of consumption. Nevertheless, our finding is consistent with reports from European populations. In view of the concept considering obesity as inflammation, the role of fast food in IBD was expected. Fast food consumption is usually associated with sweetened gaseous drinks consumption which contributes to high energy intake. Therefore, the finding of a pattern towards an association of frequent sweetened gaseous drinks consumption with IBD was expected, a finding that is in line with studies in other populations. The role of fruits in the prevention of IBD has been reported in many studies. In this report, the finding of statistically significant association between less fruits intake and IBD is in line with the results of previous studies from other populations. In a systematic review, it was found that high fruit intakes were associated with decreased risks of UC and CD. In addition, a recent study from Australia reported a protective effect of high fruit intake in UC. The lack of association of consumption of vegetables and IBD in this study is in line with some studies, but contrasts with others. However, although the lack of statistically significant association between fast food, sweetened gaseous drinks, and vegetables with IBD could be real, it may be explained by the small sample size of this study as well as the semi-quantitative measure of food intake. The recall bias is a common problem to all studies of this type. The small sample size was due to the rarity of pediatric-onset IBD and requirement of prospective enrollment. The semi-quantitative measure of food intake may have affected statistical significance of association. The findings of statistically significant positive association between less fruit consumption and IBD and trend of negative association with fast food and sweetened gaseous drinks in this population are in line with most studies from other populations, suggesting universal dietary risk factors in IBD. These results may be considered preliminary and further prospective studies with larger sample size and more quantitative measures of food intake are needed. In the meantime, the benefits of frequent fruit consumption and the risks of frequent fast food and sweetened gaseous drinks should be part of public health education programs. Montgomery SM, Morris DL, Thompson NP, Subhani J, Pounder RE, Wakefield AJ. Prevalence of inflammatory bowel disease in British 26 year olds: National longitudinal birth cohort. BMJ 1998; 316:1058-9. Kugathasan S, Judd RH, Hoffman RG, Heikenen J, Telega G, Khan F, et al. Epidemiologic and clinical characteristics of children with newly diagnosed inflammatory bowel disease in Wisconsin: A statewide population-based study. J Pediatr 2005;143:525-31. Zheng JJ, Zhu XS, Huangfu Z, Gao ZX, Guo ZR, Wang Z. Crohn's disease in mainland China: A systematic analysis of 50 years of research. Chin J Dig Dis 2005;6:175-81. Desai HG, Gupte PA. Increasing incidence of Crohn's disease in India: Is it related to improved sanitation? Indian J Gastroenterol 2005;24:23-4. Bernstein CN, Shanahan F. Disorders of a modern lifestyle: Reconciling the epidemiology of inflammatory bowel diseases. Gut 2008;57:1185-91. Gentschew L, Ferguson LR. Role of nutrition and microbiota in susceptibility to inflammatory bowel disease. Mol Nutr Food Res 2012;56:524-35. Lindberg E, Tysk C, Anderson K, Järnerot G. Smoking and inflammatory bowel disease. A case control study. Gut 1988;29:352-7. Radford-Smith GL, Edwards JE, Purdie DM, Pandeya N, Watson M, Martin NG, et al. Protective role of appendectomy on onset and severity of ulcerative colitis and Crohn's disease. Gut 2002;51:808-13. Cornish JA, Tan E, Simillis C, Clark SK, Teare J, Tekkis PP. The risk of oral contraceptives in the etiology of inflammatory bowel disease: A meta-analysis. Am J Gastroenterol 2008;103:2394-400. Hildebrand H, Malmborg P, Askling J, Ekbom A, Montgomery SM. Early-life exposures associated with antibiotic use and risk of subsequent Crohn's disease. Scand J Gastroenterol 2008;43:961-6. Cipolla G, Crema F, Sacco S, Moro E, de Ponti F, Frigo G. Nonsteroidal anti-inflammatory drugs and inflammatory bowel disease: Current perspectives. Pharmacol Res 2002;46:1-6. IBD Working Group of the European Society for Paediatric Gastroenterology, Hepatology and Nutrition. Inflammatory bowel disease in children and adolescents: Recommendations for diagnosis – The Porto criteria. J Pediatr Gastroenterol Nutr 2005;4:1-7. Hebden L, Kostan E, O'Leary F, Hodge A, Allman-Farinelli M. Validity and reproducibility of a food frequency questionnaire as a measure of recent dietary intake in young adults. PLoS ONE 2013;8:e75156. Di Noia J, Contento IR. Use of a brief food frequency questionnaire for estimating daily number of servings of fruits and vegetables in a minority adolescent population. JAm Diet Assoc 2009;109:1785-9. Chapman-Kiddell CA, Davies PS, Gillen L, Radford-Smith GL. Role of diet in the development of inflammatory bowel disease. Inflamm Bowel Dis 2010;16:137-51. D'Souza S, Levy E, Mack D, Israel D, Lambrette P, Ghadirian P, et al. Dietary patterns and risk for Crohn's disease in children. Inflamm Bowel Dis 2008;14:367-73. ESPEN guideline: Clinical nutrition in inflammatory bowel disease. Clinical Nutrition 2017;36:321-47. Ledikwe JH, Blanck HM, Kettel Khan L, Serdula MK, Seymour JD, Tohill BC, et al. Dietary energy density is associated with energy intake and weight status in US adults. Am J Clin Nutr 2006;83:1362-8. Burisch J, Pedersen N, Cukovic-Cavka S, Turk N, Kaimakliotis I, Duricova D, et al. Environmental factors in a population-based inception cohort of inflammatory bowel disease patients in Europe – An ECCO-EpiCom study. J Crohns Colitis 2014;8:607-16. Wensveen FM, Valentić S, Šestan M, Turk Wensveen T, Polić B. The “Big Bang” in obese fat: Events initiating obesity-induced adipose tissue inflammation. Eur J Endocrinol 2015;45:2446-56. Russel MG, Engels LG, Muris JW, Limonard CB, Volovics A, Brummer RJ, et al. Modern life in the epidemiology of inflammatory bowel disease: A case-control study with special emphasis on nutritional factors. Eur J Gastroenterol Hepatol 1998;10:243-9. Hou JK, Abraham B, El Serag H. Dietary intake and risk of developing inflammatory bowel disease: A systematic review of the literature. Am J Gastroenterol 2011;106:563-73. Niewiadomski O, Studd C, Wilson J, Williams J, Hair C, Knight R, et al. Influence of food and lifestyle on the risk of developing inflammatory bowel disease. Intern Med J 2016;46:669-76. Ananthakrishnan AN, Khalili H, Konijeti GG, Higuchi LM, de Silva P, Korzenik JR, et al. A prospective study of long-term intake of dietary fiber and risk of Crohn's disease and ulcerative colitis. Gastroenterology 2013;145:970-7. Racine A, Carbonnel F, Chan SS, Hart AR, Bueno-de-Mesquita HB, Oldenburg B, et al. Dietary patterns and risk of inflammatory bowel disease in Europe: Results from the EPIC study. Inflamm Bowel Dis 2016;22:345-54.